Circle Line Island Cruise: Is It a Must See in NYC? The Circle Line is a popular tourist attraction in New York City. Is it worth the price if you're visiting the area? Normally when I travel, I try to avoid overly "touristy" attractions and tours. But recently nostalgia got the better of me and I felt the urge to take a Circle Line sightseeing cruise of New York City - something I hadn't done for about 30 years. The Circle Line cruises have in fact been running since 1945, offering full island tours around Manhattan, trips to the Statue of Liberty, and today even high-intensity speedboat rides. I remembered taking the full island tour once when I was a child, back in the early 1980s, and how I had found it a fascinating way to see all of the city from the water. And since I'm always trying to explain NYC's geography to my sweetie, I thought the best way for him to finally start to understand it all would be via boat. So in May 2013 we took the Circle Line "Full Island Cruise", although it didn't quite end up being precisely that...more on how it came up short later. If you're planning a trip to New York and want my honest opinion on whether this cruise is worth your time, read on. I'll share my tips on how to make the most of the experience if you do go, depending on your interests: a history lesson on NYC, terrific photo-ops, or just a relaxing cruise for an afternoon. All photos on this page are by the author, sockii, unless otherwise indicated. You can view my full Circle Line Photo Gallery on Flickr. Circle Line offers several different types of cruises, and the cruise schedule changes through the seasons (though boats operate year-round, just on limited schedules in winter months.) The full island cruise is their most popular one, completing (tides permitting) a complete circle of Manhattan Island in three hours' time. The semi-circle cruise will take two hours, and give you great views of downtown and midtown Manhattan and the Statue of Liberty. The Liberty Cruise goes from 42nd Street to the Statue of Liberty and back - it takes a little over an hour and it should be noted that as of May 2013, Liberty Island was still closed to visitors due to damage from Hurricane Sandy. There are also other specialty cruises including a 30 minute Speedboat ride known as "The Beast", an evening "Harbor Lights Cruise" for a more romantic experience, and Thursday night DJ Dance Cruises in the summer months. Prices for the cruises vary; as of May 2013 the full island cruise is $38 (plus "fuel surcharge") for adults, $25 for children. Shorter cruises are less expensive but still in the $20-and-up range. If you purchase a New York CityPASS you can use that for a Circle Line cruise admission as one of your included attractions. Circle Line also offers bus tours of the city and you can get combined tickets on their website. You can buy Circle Line tickets at the Pier or reserve your tickets on line - but keep in mind if you buy online you'll still need to get IN a pickup line again at the Pier an actual boarding ticket. However you may be able to find discount coupons online and save some money. There is a refreshment counter on board the boat for the sightseeing cruises. You can get basic snack items like chips and ice cream, soda, and even beer, wine or basic cocktails. Please note that most of the time their credit card reader doesn't seem to work so on board, so you'll need to bring cash if you plan on snacking (or drinking). 1. Check boat schedules first - and show up at least an hour before your scheduled departure time for the best seats. Although the website says to give yourself 45 minutes before departure time to buy tickets and line up for your boat, I'd recommend more like 1 hour - 1 hour and 15 minutes if you really want a prime seat with the best views. The ticket lines can be long and slow moving, because of tourists who didn't research their options first and just show up confused! Even if you book your tickets on-line, you'll still have to line up (at a separate pickup window) to exchange your voucher for an actual boarding ticket. 2. Want the best views of Manhattan? For the full island cruise, be sure to sit on the left-hand side of the boat. The left side will face Manhattan the whole time if the full circle takes place (see further note below). If you sit on the right-hand side, instead you'll get far less-exciting views of New Jersey, Brooklyn and Queens. 3. Note that the full island tour isn't always that - and they won't tell you until you board. During periods of high tide, the supposed full island cruise will become more of a drawn-out "U" because the boat cannot pass safely under some bridges in northern Manhattan. They won't tell you about your odds of this being the case on the web site or when you buy your ticket, only once on board the boat, which kind of stinks since obviously they know what the tide predictions are ahead of time - anyone can check them online for themselves. The ride is still enjoyable but you don't get to pass under the George Washington Bridge and see the northern sights of the island - and it can be a little boring passing back over the same route twice (albeit in different directions so both sides of the boat get the views of Manhattan). In other words it becomes a slightly longer version of the semi-circle sightseeing cruise at a higher price. 4. Don't get a seat right away on the outside deck? Don't worry too much. Once the boat has left the dock, they do open up the small front deck on the lower level for people to stand outside on - and this is actually where you will get some of the best photo-opportunity views of all. Also, note that some people will get bored or cold up on the top deck after an hour or so and come inside - so you may be able to get a seat outside later on in the ride. 5. Bring a warm jacket (and sunscreen)! Even if it's a warm and sunny day, note that the temperature will be much cooler on the water - and it'll be windy as well. If you're determined to sit outside, be sure to dress warm. You should also protect your skin from the more intense sunlight while out on the water so wear a hat and/or bring some sunscreen lotion. 6. Is hearing the tour guide narration important to you? If so, sit on the upper deck inside. The sound system on the Circle Line is not the greatest. The narrator sits in the upper closed deck and that is really the only place you will be able to hear him clearly (over the sounds of the water, the boat's motor, lots of yelling children and foreign-language tourists simply ignoring the narration completely and chatting over everything.) You'll miss a fair amount of interesting trivia and facts about New York City if you can't hear what he has to say. Is the Circle Line Cruise Worth It? 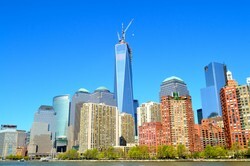 So, is taking one of the Circle Line cruises worth your money if you're visiting New York City? I would say that answer rather depends on your time, interest and of course available funds. I personally feel it is a great way to get a real sense of the city and surrounding area. As compressed and compact as Manhattan seems when you're on its streets, it suddenly becomes immense and more impressive than ever from the water. These are not views of the city you can really enjoy or experience otherwise (though if you just want to pass by the Statue of Liberty and see downtown, you can take the Staten Island Ferry for free.) As you ride by the different areas of the city you get a sense for their unique character and architecture, from the Financial District to Midtown, the Upper East and West Sides, Harlem and Brooklyn Heights. If you only have a very limited time in the city on your vacation trip, it might not be worth your time (neither the full island or the semi-circle cruise.) Given how you have to show up at least an hour in advance for ticketing and seating, plus then spend 2-3 hours on the boat, it will easily eat up half a day of your visit. However if you have a week or more in the city - or if you're someone like me who tends to visit New York at least several times a year - it can be a fun way to spend especially a good weather morning or afternoon. Should you take the full island cruise or the semi-circle? Again, it depends...and it can be disappointing to show up for the full island cruise and end up having it only be an elongated semi-circle anyway. That said, you can make an argument that the additional sites seen on the full island aren't really as exciting or interesting as on the semi-circle. I would also say that small children tend to get very restless on the boat, particularly on the longer cruise - and that can make for an annoyance to the other passengers trying to actually enjoy the scenery and listen to the tour guide. So for them I'd stick with a shorter cruise (perhaps the 30-minute speedboat ride) and combine it with a visit to the neighboring Intrepid Museum. Planning a trip to NYC? The oldest operating hotel in New York City, The Algonquin was the meeting place for the famous 'Vicious Circle' of literary giants.